GW's Paula Harper & Dova Wilson (4th and 5th from left) shown with LCPS partners and fellow awardees. 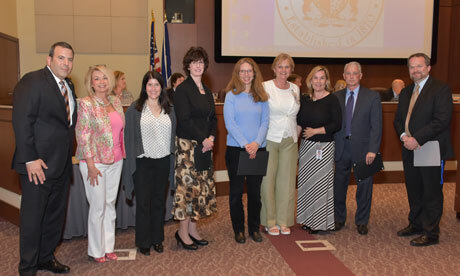 The Loudoun County School Board passed a Resolution naming GW to the 2016 Virginia School Board Association (VSBA) Business Honor Roll for ongoing support of Loudoun County Public Schools (LCPS). The Resolution was presented to the awardees during the May 10, 2016 School Board Meeting. This recognition is connected with the prestigious Loudoun School-Business Partnership Award of Excellence that GW received in March. 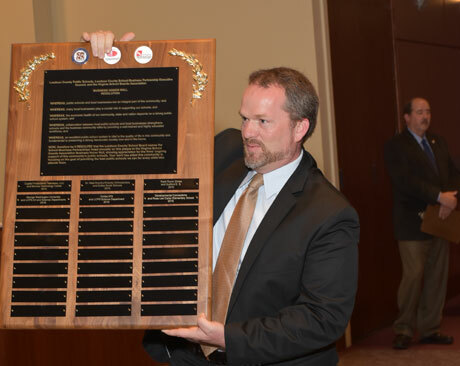 The Loudoun School Business Partnership Executive Council received 240 applications this year, with only five receiving the 2016 partnership awards. Of these, the School Board nominated three of the five winners to the VSBA Business Honor Roll, including GW, Orbital ATK, and Developmental Connections. The partnerships with LCPS began more than 15 years ago and have expanded to include close working relationships with the art and science departments. Thousands of LCPS students and teachers have benefited from exposure to new experiences and hands-on learning, especially in STEM-related fields. These partnerships reflect GW’s long-term commitment to community engagement and are closely tied to the university’s educational mission and core values. Each partnership is unique, but overall they have provided wide-ranging experiences and resources to thousands of LCPS students and teachers. Administration Building, with room for future year awardees.